Over the past 200 hundred years the treatment available to people with mental health problems has changed dramatically. In Glasgow the buildings and institutions to lock up or look after these people has also changed. In the early 1800s "lunatics" would be locked up in their own sections of the poorhouse. Then huge asylums were built to house these people together, away from the rest of society. Few medical treatments were available in the early days of the asylums but a more humane regime of management was reflected in the building throughout the 19th century of grand asylums on the outskirts of the city with their own land for outdoor sports, farming and gardening. In the 20th century new drug treatments became available, alongside ideas that we were making some people worse by locking them away, separate from the rest of society. So now the large Victorian asylums and mental hospitals have all but closed down in the past 20 years. Many of the buildings still stand, so I wanted to try and see where they were and find out a bit more about the history of the old Glasgow asylums before they vanish completely. Last December I wrote here about the poorhouses of Glasgow, the Scottish equivalent of the English workhouses. On reading up on this subject I looked into the story of my family members who had asked for help from the Poor Relief authorities. This led me to the story of a distant uncle who sought their help in 1923 when he was unable to work. After assessment at Duke Street Hospital, the doctor declared that he "is mental" and he spent 5 months in Woodilee Hospital before being released back home. This illustrated the overlapping roles of poorhouse institutions at that time with asylums; of mental illness and poverty. The language used - asylum, madhouse, lunatic - now has negative and pejorative associations, but the words used reflected the ideas people had at the time. In the 17th and 18th century someone called mad or a lunatic could be suffering from a variety of problems. The management of these people involved detention, restraint and isolating them from the rest of society. The alternative was often otherwise for them to end up on the street if they did not have family who could look after them. The poorhouse became the place to keep elements of society seen as disruptive, those impoverished but physically or mentally unable to work. The early poorhouses of Glasgow usually had a section reserved "for lunatics" to use the language of the time. This described people who could be confused, violent, suffering from delusions, seizures, loss of memory or the ability to communicate, or from physical health problems causing mental impairment which nowadays could be treated, such as thyroid deficiency or end-stage syphilis. Other people were purely locked up in asylums because they didn't fit in with the norms of society at the time - petty criminals, delinquents, or even women who had got pregnant out of wedlock. With the establishment of the Glasgow Magdalene Asylum in 1812 unmarried mothers, prostitutes and even women thought to dress immodestly were often taken here instead of the mental asylums, but not always. 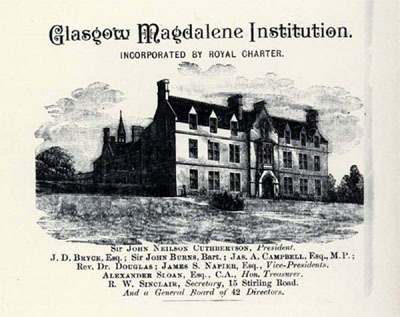 From 1859 this became the Magdalene Institution and in 1864 it moved to Lochburn Road in Maryhill, where it operated until as recently as 1958 when it was closed after a riot by the residents/inmates. It seems bizarre to think that as recently as this women were taken here and mistreated for having a lover, "trained" in the laundry there and often put into domestic service "or other respectable service" as their adverts put it, "rescued from a life of shame and restored to society". In the early 18th century, when the population of Glasgow was reaching 15,000, it was decided that the city needed a hospital and poorhouse. On the north bank of the river Clyde the Town's Hospital and Poorhouse was built in 1731, close to where St Andrew's Cathedral now stands. "Lunatics" were held in cells in the basement, often chained up. Despite these basement cells often flooding from the Clyde this building served as the main poorhouse in the city centre for over 100 years. One of the directors of the poorhouse, Robert McNair of Belvidere, for many years a collector of customs at Leith, decided to provide better accommodation for "the insane folk". A book of 1888 describes it like this. "the heart of this good man was touched by the wretched condition of the insane folk, who at the beginning of the century, whatever their social condition, were kept in "the cells" at the Poorhouse at the banks of the Clyde; and, as improvement of the cells was impossible, he determined to procure for them better care and treatment elsewhere"
An important notion here is that rich and poor were having to endure the same conditions and throughout the 19th century care would have divisions on class. McNair raised £7000 and in 1810 the foundation stone was laid for The Glasgow Asylum for Lunatics which opened 4 years later in 1814. Ten years later they were given a Royal Charter and the name changed to The Glasgow Royal Asylum for Lunatics. This building was on a site located near to where Buchanan Street bus station now stands, on what was Parliamentary Road. On this map from 1830 you can see the cross-shaped "lunatic asylum" in empty land between Cowcaddens quarry and Dobbies Loan. The Glasgow Royal Asylum for Lunatics provided separate wings for male and female patients and also patients could be separated by class with access to distinct airing courts to exercise in good weather, whilst being observed from staff within the building. In the 1814 regulations for staff (or "keepers" as they were called) they are forbidden "to strike or strive with a patient" or "to subject a patient to confinement, privation or punishment of any kind without express instructions from the physician or superintendent". The keepers are instructed to consider "the patients as utterly unable to restrain themselves, the keepers must forgive all sarcasms, and treat with equal tenderness those who give the most and those who give the least trouble". The treatment was to consist of "harmless amusements, wholesome exercise, and useful labours". An 1816 report on the institution comments on the two looms for patients use, weaving and sewing are seen to be taking place whilst some patients write poetry or read to their fellow patients. 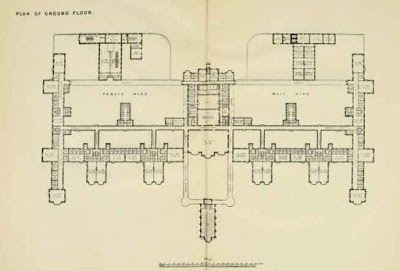 The stated aim is "to remove from the Asylum, as much as possible, all appearance of a prison." One stated reason for this was to try and improve people's symptoms early, to avoid where possible the "accumulation of incurable cases". A bowling green and billiard room were added to the facilities in 1819 and in 1820 the value of outdoor labour is discussed in the annual reports, with gardening recommended for gentleman patients. "Cottages and suites of apartments separate from the ordinary wards are to be provided for the high-class patients". Despite these wholesome sentiments it is clear that restraints and punishments are still part of the regime at this time, even if it is being limited to "only when instructed to by the physician". In the 1817 annual report an officer is thanked by the board "for inventing a leather muff which is better, and much less irksome than a strait waistcoat....it is more seemly than handcuffs of iron, and in cold weather less disagreeable". In the 1819 report it is reported that "rotatory motion, by means of a whirling chair, has of late been tried in a great number of cases, and in some of them, with wonderfully good effect". The aims through all of this are stated as "moderating excitation and promoting convalescence". As the city was expanding quickly in the 19th century there was no room at the city centre site to expand the facilities here. By the 1840s there were new ideas about how people with mental illness should be treated. In society at this time attitudes were changing. Just as slavery was being abolished, and people now saw these slaves as fellow humans due the same respect as others, more people realised that the "mad" were also fellow humans, to be treated with kindness and understanding rather than punishment. New asylums were built. The Town's Hospital and Poorhouse moved from the Clydeside into the Royal Asylum building on Parliamentary Road when it was vacated. The old buildings proved inadequate for the type of treatments being devised for people with severe mental health problems in the 19th century and new facilities (or "asylums") were built. "To prevent misapprehension regarding the provision for the insane poor in Scotland, it may be well to state that the majority are accommodated in the Royal and District Asylums. A portion of chronic and harmless insane occupy special wards in ordinary poorhouses....a considerable body reside with their relatives, while a large and steadily increasing number are boarded in specially licensed private houses, but not more than four under one guardian. This last arrangement is known as the Scottish boarding-out system, and does not exist in any other country." The later built Eastern General Hospital (Duke Street Hospital) was designed for the acutely sick poor, but also had beds specifically for psychiatric assessment, a novel arrangement of 22 beds for mental observation cases. This was where my great uncle William was assessed for four weeks in the 1920s before being transferred to Woodilee. The theory at the time was that specifically designed buildings would help the patients, taking them away from their home environment which was often believed to be a causative factor in their presentation. The idea was to provide calm, rest, and work to keep people occupied. Staff usually lived in the grounds creating a feeling of community. Work could involve farming, gardening, preparing food from the grounds, sewing, even writing and art classes. The asylums were designed to be largely self-sufficient in food. Despite all this recovery rates were often low and although no longer as prominent as before, locked doors and restraint, such as straight jackets, were often still required. 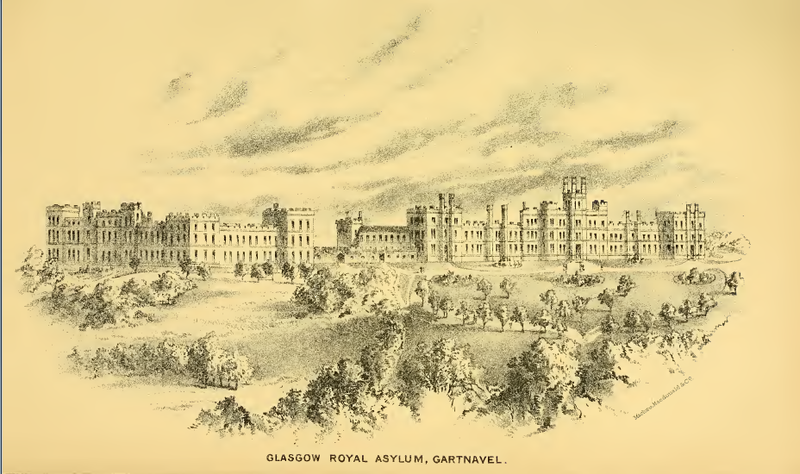 In 1841 a new site was identified for The Glasgow Royal Lunatic Asylum and in 1843 the Royal Asylum at Gartnavel was opened. This Tudor Gothic building stood at the top of a small hill within 66 acres of "pleasure grounds". It consisted of two separate buildings, providing a building each for "higher and lower class of patients". As before there were separate wings for each gender. There were also several associated administrative buildings and a chapel built. For most of its history until the formation of the NHS in 1948 the hospital at Gartnavel housed mainly private patients, with those unable to pay sent to the Parochial Asylums such as Woodilee and Gartloch. In 1888 a report states that the Royal Asylum "accommodates 500 patients, at boards varying from the pauper rate to £400 a year or upwards, according to the accommodation, care, and service required". 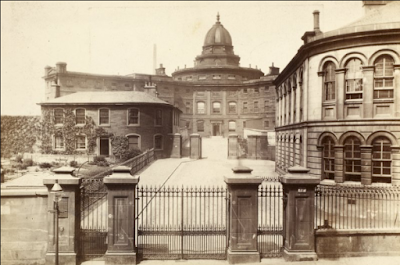 From the opening as the Glasgow Asylum for Lunatics in 1814 until a report for the British Medical Association in 1888, the hospital states that it had treated 14,765 "insane patients". Of these it reports 6,476 (43% ) had been discharged as recovered. In the year of the report, 1887, they reported 45% of patients discharged as recovered and 5.5% of the residents under treatment having died at the hospital. The west building at Gartnavel Royal as it is today. A 1922 report for a later BMA meeting in Glasgow describes the Gartnavel hospital as becoming rather dated, though being in advance of its time when it was built "perhaps more institutional and concentrated than would be adopted now". At that time the 500 patients were paying rates of between £58 and £600 per annum. They describe the grounds in 1922 as containing a golf course, tennis courts, a croquet lawn and a curling pond. 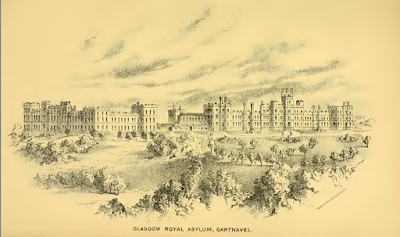 In 1931, with evolving attitudes to treatment, the name was changed to the Glasgow Royal Mental Hospital, and in 1963 it became Gartnavel Royal Hospital. Gartnavel General Hospital was built in the grounds in 1968 with the loss of some sport and recreation amenities. In the 1960s there was still a piggery in the grounds for patients to work at. In 1953 after leaving the army, RD Laing started his psychiatry career here. He worked in wards at Gartnavel filled with long term patients, many labelled as having chronic schizophrenia. Their care provided little more than basic necessities, certainly little interaction from medical staff. He trialed some novel approaches here and published a paper in The Lancet in 1955 about dramatic improvements he saw in some patients managed differently, having a smaller group of nurses giving the patients continuity of care and more interaction. These experiments shaped his future, more radical ideas. He later worked at the Glasgow University academic psychiatry department based at the Southern General Hospital before heading to the Tavistock Hospital in London in 1956. The west block of Gartnavel Royal is still used today, but now by administrative departments of Glasgow Health Board. Psychiatric in-patients are now housed in modern facilities in the hospital grounds which have been built over the past 15 years, with 117 beds. Since 2006 the eastern block has been closed. Boarded up and beginning to look a bit shabby and neglected, Glasgow's appalling record of allowing buildings to become dangerously abandoned and decayed until a mysterious fire requires their demolition must make the future of this building very uncertain. Under the Poor Law (Scotland) Act of 1845, the duty of providing care and treatment for "lunatics" passed to Parochial Boards. The Barony Parish of Glasgow was the most populous in Scotland, having to cater for almost 300,000 people. With growing demand the 150 beds at Barnhill Poorhouse were insufficient for the needs of the area. Opened in 1875 as the Barony Parochial Asylum, at Woodilee near Lenzie, this new asylum was the first asylum specifically built to house the lunatic residents of the poorhouses. With a capacity initially of 600 patients it was also sometimes known as The Glasgow District Asylum. Where Gartnavel had incorporated the most modern ideas in asylum design 30 years earlier, Woodilee was another step forward. The aim was to house "pauper lunatics" in the quiet and seclusion of the countryside. There were more comfortable day rooms, outdoor airing areas were not walled-in prison-style, and instead of long wings of sleeping areas these were broken up into smaller sections. The main treatments were still to involve rest, seclusion and work on the extensive surrounding grounds and farm areas. There were four farms here, on the 167 acres of land that were part of the hospital complex, plus almost 300 acres more land which the Parochial Board bought or leased nearby, largely to farm. Doors were not locked and after their work patients were allowed to wander in the grounds. The main building was 700 feet long, with a corridor running its entire length. Over the years a variety of other administrative and clinical buildings were added within the grounds. This old postcard below gives a sense of the scale of the complex, which is impossible to imagine now on visiting this area. About 1988 I spent a few weeks here as a student and remember it being an impressive and extensive complex of buildings, filled with dated furniture and fittings. With its grand Gothic buildings it did feel a bit "Arkham Asylum". It seems bizarre that none of this still stands. In 1900 a villa, built to house "mentally deficient children", was added and by 1915 the hospital had 1300 beds. With the greater numbers the freedoms and activities patients previously enjoyed became greatly curtailed, although patients continued to work on the farms up until the 1960s. Like many other hospitals the introduction of effective medicines in the 1950s and 1960s changed the role of psychiatric hospitals. Many previously bed-ridden patients became able to mobilise and a bigger role for out-patient and voluntary treatment evolved. One of the few remaining old buildings integrated into the vast modern housing development that is "Woodilee Village"
In 1987 large parts of the hospital had to be closed after serious structural problems were identified. As more patients were discharged to other types of care, the hospital began closing in stages at this time and by 2001 it had closed completely. Almost nothing stands of the fine French Gothic style buildings now. Two serious fires in the 1980s (YET AGAIN!) 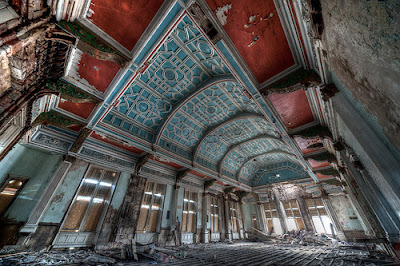 led to most of the building being demolished in 1990. Now developers continue to build modern housing on the vast lands the hospital stood on, and by the end of this process the housing will have increased the population of Lenzie by about 2000 people. Having previously visited Woodilee Hospital when it was still open I was entirely unable to orientate myself today in the jumble of housing developments thrown up as "Woodilee Village". It is a village of housing, no village shops, pub or post office appears to have been thought of as part of the development yet. Bizarrely the developers' website talks about the "tranquil Victorian village developed after 1842" but makes no mention of the asylum and its vast community that lived here for over 100 years. It seems such a shame to make no attempt to remember the lives of the people who formerly lived here. I found three very small bits of the old Victorian buildings of Woodilee Hospital still standing from all the vast complex that you can see on the postcard above. 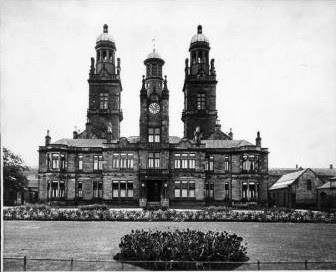 Gartloch Hospital opened as Gartloch Asylum in 1896 near the village of Gartcosh, just east of Glasgow. 100 years later in 1996 it finally closed. Gartcosh was originally an agricultural village, which became know in the late 1800s for its ironworks and later steelworks. 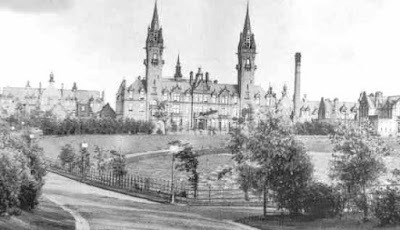 Gartloch Asylum was another asylum set in the countryside with patients/ residents engaged on farming the land attached to the asylum, an estate of 440 acres. It initially had 560 beds, half each for men and women. The land of Gartloch Estate was bought by Glasgow City Corporation for £8,600 for the "Glasgow District Lunacy Board" to build an asylum here. The 1899 annual report for Gartloch asylum gives some details about the 203 admissions that year. 63 of them were re-admissions, 7 were aged over 70 and two over 85 years of age. They comment that because of their "frail and interfering ways (t)hey must be kept apart from the acute and excited cases." Alcoholic intemperance is quoted as a significant contributing cause of insanity in 50 of the cases. "General paralysis" was the diagnosis in 18 cases, an insanity which occurs in end-stage syphilis. 44 cases were "boarded-out" in the year, to private homes as described above. 38 patients died in the asylum that year, of these 11 died from "general paralysis" and 7 from tuberculosis. Also of note "there were 11 escapes during the year." The later records from Gartloch Hospital held by Greater Glasgow and Clyde Health Board Archives give intriguing glimpses of some of the activities residents were involved in. "Work, especially out-of-door employment on farm and garden, for men and women, has benefited many....Recreation and treatment go hand-in-hand, the grounds adjoining the Loch affording a delightful summer resort for suitable cases." They also talk of "prolonged rest in bed" for acute cases, which sounds rather enforced, but does not share any detail. Titles of documents include numerous sports days, tug of war, cricket matches and football matches in the 1920s. There is mention of a 1920 cricket match between Pollock and Gartloch. Day trips to Loch Lubnaig, to the bowling green at Woodilee Hospital or curling on Bishop Loch are also mentioned. In the early 20th century the role of the hospital and the buildings on the site were expanded, and a tuberculosis sanatorium was opened here, to take advantage of the cleaner air away from the city. The hospital capacity increased to over 900 patients at that time. Like many other hospitals in the city it was converted into use as an Emergency Medical Services hospital during World War 2 with psychiatric patients moved to other hospitals in Glasgow (mainly Gartnavel Royal Hospital) or to temporary huts built in the grounds. Since the hospital closed it has been a regular haunt of "urban explorers" clambering about inside the old buildings. Much of the land in the grounds have been re-developed as "Gartloch Village", a cluster of "luxury apartments" covering the land. There is now a significant amount of housing here and plans to expand it further, but as at "Woodilee Village" the housing has no other local amenities, no shops or doctors' surgeries and the narrow road through the countryside to Glasgow is the only way in or out. The main hospital building is listed, so the plan is not to demolish it. It is still awaiting redevelopment. "Glasgow based architects, Thomson & Sandiland subsequently won a competition to design a new hospital. It opened in 1896 and was immediately hailed as a Victorian architectural masterpiece. The hospital served the local community and returning war heroes in the decades that followed. Today as the custodians of Gartloch we are proud and privileged to reclaim the Victorian craftsmanship and surroundings for the benefit of future generations. " As hospitals established separate provision for patients with mental health problems at the end of the 19th century several new asylums or hospitals were built. 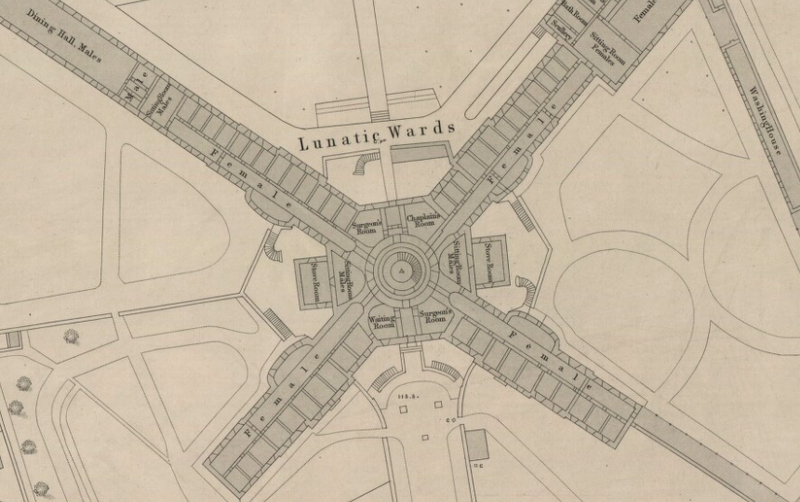 With a rapidly growing population Govan Parish was particularly struggling to accommodate their "lunatics" at the Merryflatts Poorhouse on Eglinton Street. In the 1870s the poorhouse was largely functioning as an asylum and having to turn many others away. When the population of the parish increased from 1871-1881 from 161,000 to 238,000 plans for a new asylum were drawn up. Eventually appropriate land was identified on Crookston Road. 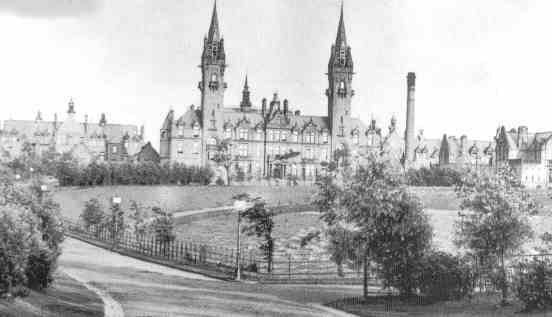 Built in 1893 and opened 2 years later, this Govan District Asylum later became known as the Hawkshead Asylum, then finally Leverndale Hospital, the name it has carried since 1964. Hawkshead Asylum opened with a capacity of 400 beds and in the early 20th century it accommodated over 500 patients, divided into "hospital" and "asylum" sections. 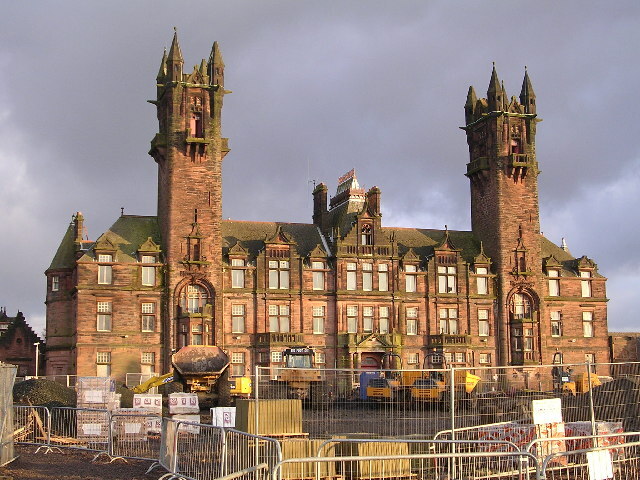 The Govan Parochial Asylum at the Southern General site continued to function in the way Duke Street Hospital did for Woodilee, as an assessment and admission unit. In the 1970s a 120 psycho-geriatric unit was added and over the next 20 years patients were moved from the old asylum wards to new buildings on a lower part of the original site. Although Leverndale Hospital still functions as a psychiatric hospital, the old buildings no longer house the hospital but have been sympathetically converted into modern housing with new buildings added on a similar scale to the old buildings. The distinctive water tower at the centre that can be seen from all around Crookston and Pollok has been maintained too. Of all the hospital sites I cycled around to get these photos, this seems to be the only one where the old buildings have been looked after and incorporated into the development, rather than left to decay or just swept away. Whilst it is understandable that the Health Board has sold off much of the huge acres of land that the asylums were built on, it is land and property that was owned by all of us under the auspices of the NHS, now transferred wholesale to private developers. You can only sell it once, and then it is gone forever. Lennox Castle Hospital, to the north of Glasgow, near Lennoxtown, was housed in an earlier building than those mentioned above, but it was from the 1930s that it became a psychiatric facility. Built in the 1830s this large three story mansion was designed with castellated corner towers for John Lennox Kincaid. During World War I the mansion was requisitioned for use as a military hospital. In 1927 Glasgow Corporation bought the mansion and surrounding lands of 1,222 acres (for £25,000) with the aim of using it as a hospital for those with mental illness. 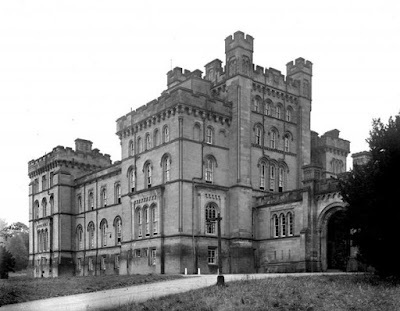 In 1936 it was officially opened as the "Lennox Castle Certified Institution of Mental Defectives". Twenty dormitory blocks were built in the grounds, to accommodate 1,200 patients. When the dormitories were completed the patients, who had temporarily been housed in the castle, were moved into them and the castle became the nurses home. There were also in the grounds 40 houses for married staff members, dining halls, kitchens, workshops, etc. This Open University video tour from an ex-nurse from the final days of the hospital gives an idea of the layout of the hospital. Apart from the castle building, all the buildings in this video have now been demolished. During World War II the hospital was again used as a military hospital, with patients with mental health problems being re-housed in huts built on the site - many used for the next forty years. A maternity unit was also set up in the hospital from 1942 until 1964. With changes in the management of people with learning difficulties and mental health problems the hospital began to be closed in phases. The aim was to move patients away from institutionalised care to living in the community where possible. At this time many patients had spent their whole life until then in the hospital. The policy of "care in the community" has been criticised as a cost-cutting exercise. It also shifted care for many people with long term mental health problems and learning difficulties away from the NHS, into the hands of private care companies bringing market economics to an area of public healthcare. However, when done properly, for many of the patients the move out of a hospital environment did greatly improve their quality of life and expand their world. Lennox Castle Hospital finally closed in 2002. Two years after closing only the original mansion building was still standing as the land was cleared by developers, knocking down all the other hospital buildings. In 2007 Celtic Football Club opened their new team training facilities on the land and property developers have been building housing on other sections of the land. In 2008 one of those mysterious Glasgow fires, that happen to break out in old, disused buildings which are expensive to maintain, caused extensive damage to the old building. What was once so grand, this 175 year old mansion is now little more than a shell. Although Dykebar Hospital is a little way from Glasgow, on what was then a rural setting on the outskirts of Paisley, I have included it here as it being closed down in stages at present, much as happened in the other old asylums and psychiatric hospitals of the West of Scotland over the past two decades. It opened in 1909 as the District Asylum for Renfrew Lunacy District. Paisley and Johnstone had their asylum at Riccartsbar, and Greenock an asylum at Smithston, now Ravenscraig. A central administrative wing and 2 villas for men and 2 villas for women were built. Further buildings were soon added due to overcrowding. Along with store buildings, a laundry, kitchen, a superintendent's house, workshops, nurses' homes and a mortuary an asylum complex soon grew up like a self-contained village with associated farmland. Around 300 patients lived here at this time and, as at other asylums, the aim was to create a feeling of community. The earliest patients were employed in putting the grounds in order, and then later residents worked on the neighbouring fields raising cows, pigs and poultry, growing turnips, potatoes, a vegetable garden, glasshouses and potting sheds. They also built and looked after a bowling green, tennis courts and a birdhouse. During World War I residents were moved to other institutions when it was used as a war hospital, except for some patients kept on to run the farm. 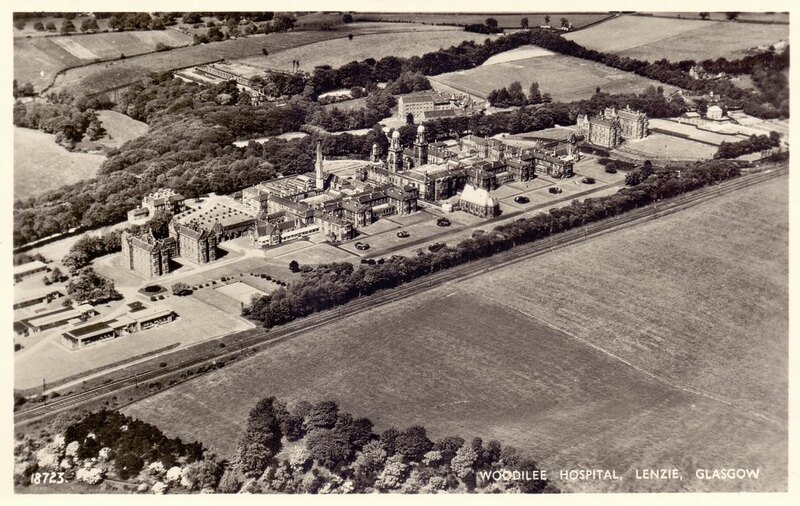 During the Second World War whilst other hospitals were used as emergency hospitals, their residents were transferred to Dykebar. When it came under control of the newly formed NHS in 1948 the asylum took the name of Dykebar Hospital and the facilities were upgraded. A modern unit was added in 1975 to accommodate psycho-geriatric patients and other amenities and in that year with the closure of Riccartsbar, the patients from there were transferred to Dykebar. At present the hospital has a variety of buildings still in use and others which are boarded up, and at times have been vandalised. Even some of the modern buildings are being closed down as less patients are treated in hospital and the emphasis shifts to treating people at home, or managing psycho-geriatric cases in nursing homes in the private sector. Again this is a part of healthcare that was previously in the hands of the NHS, but now is largely taking place in nursing homes, with means-testing to see how much you have to pay to get the care that you need. Technically the only new psychiatric hospital built in Scotland in the 20th century is Parkhead Hospital. It opened in 1988, on the same day as a Celtic v Rangers game at nearby Celtic Park. This was required due to the closure of Gartloch Hospital and the psychiatric wards at Duke Street Hospital. In-patient psychiatric wards are also present at Stobhill Hospital, Gartnavel Royal Hospital and Leverndale Hospital in the city. Nothing survives of Stoneyetts Hospital, Moodiesburn which was open from 1913 - 1992, initially as Stoneyetts Certified Institution for Mental Defectives. 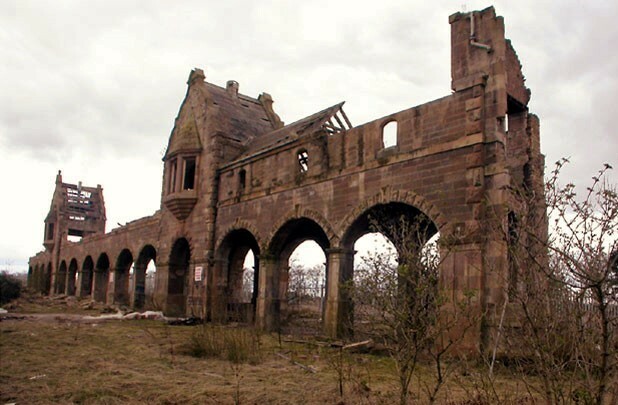 The impressive clock tower buildings of Hartwood Hospital still stand in the village of that name, in North Lanarkshire, although much damage has been done by two fires in the last 10 years. I wanted to take a brief look at the buildings in and around Glasgow that have housed people with mental health problems over the past three centuries. Looking at the bricks and mortar doesn't really tell you what life was like for individuals living in these institutions, and everyone's story and experiences are different. The stigma that many people still feel surrounding mental health problems may in part be due to the way people have been treated in the past, from being chained up in prison like conditions, to being held in remote, out of town asylums - out of sight and out of mind. The stigma and fear of the past still seems to linger, as can be seen by the way property developers trying to sell houses on the land of former asylums are coy about mentioning the real history of these sites. Only by paying attention to mistakes from the past can people avoid making the same mistakes in the future. A fascinating, and sobering, piece. Thank you.